The continuation of the planning battle which affects Ockham, Ripley, Wisley, Cobham, Clandon, Send, and the Horsleys continues with a four week public enquiry in September 2017. The Wisley Action Group (WAG) have arranged a public meeting at the Ripley Village Hall on Thursday 1st June 2017 at 7:30pm. Following a unanimous rejection by Guildford Borough Council last year, plans by a Cayman Island-based company to build over 2,000 houses on green belt land at ‘Three Farms Meadows’, the former Wisley airfield, will be the subject of a planning appeal later this year in September. The Wisley Action Group [WAG] is fighting back. It will be represented throughout the four week public enquiry by one of Britain’s leading QCs who will present the compelling case for rejection of this devastating proposal for north east Guildford. We urge you to support WAG’s fight to protect our precious countryside. WAG’s QC has described the plans as the wrong project in the wrong place, citing 14 planning reasons why it should be refused. The view was supported by Guildford’s planning officers’ report which said that the scheme represented inappropriate development in the green belt with a “clear and substantial impact on its openness” and failed to provide an “appropriate provision of affordable housing”. * Online - complete the online questionnaire. 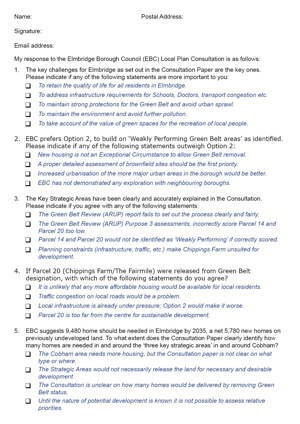 * Email - email your responses or comments on the consultation to Elmbridge BC. * Letter - write and post your comments on the consultation to Elmbridge BC. * Quick Questionnaire - download (see below) and complete the "quick questionnaire" and either post, deliver by hand or email a scanned copy to Elmbridge BC. Full details of how to respond Online, by Email or Letter can be found here or use the "Quick Questionnaire" option below. But please do it this week before 4pm on Friday 24th Feb 2017 if you want your views to be counted.